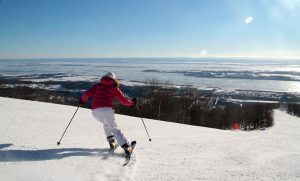 Mont Sainte Anne is just 25 miles from Quebec City in the Laurentian mountains, its well worth the ski trip to Quebec – you can visit this great French Canadian city and enjoy resort skiing with views of the mighty St Lawrence Seaway and of Quebec in the distance at Sainte Anne. Mont Sainte-Anne’s base to summit gondola is a great lift, along with four high speed quads that flank this three- sided ski mountain. From the summit, where there are two lodges including Chalet La Crete, the panorama is spectacular looking back at Quebec City and out at the St Lawrence River. 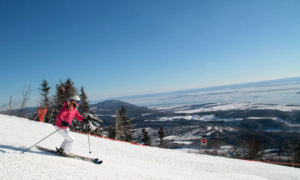 Mont Sainte Anne skis similar in size and shape to Mont Tremblant, with its three sides – but the view here is superior. 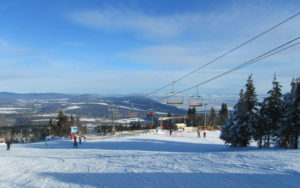 Mont Sainte Anne is owned by Resorts of the Canadian Rockies, along with nearby Stoneham, and western Canada’s Lake Louise, Kimberly, Fernie and Nakiska. 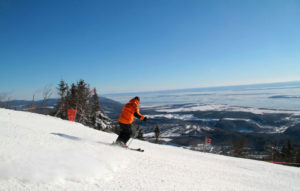 For family skiing, Mont Sainte Anne offers plenty of terrain, groomed trails like La Crete that wraps to skiers left, and the long Le Chemin du Roy which saunters over 3 miles from summit to base. Mont Sainte Anne has the most FIS homologated approved trails, like La S and La Super S – long curved trail with sustained pitch of 40-degrees, plus glades like Le Forêt Noire and La Forêt Enchantée. Moguls are very popular here, they call them “les bosse” – I am not sure who is boss of the bumps – you or the mountain. The North Side of Mont Sainte Anne offers moderately pitched slopes, typically well groomed, where the snow stays fresh, away from the sunny front side. These dozen trails and intermediate level glades are served by a speedy high speed quad back up to the summit, or you can have lunch at the Refuge de Versant Nord Lodge – much quieter than the Summit Lodge – but without the view of the River. One aspect of the 2,625′ Mountain that rarely gets discovered is the West Side, served by a reliable old t-bar. Here the three trails are left natural and are typically quiet and un-skied, perhaps because you have to ride a t-bar. Some of Mont Sainte Anne’s lifts could stand an update – which is in the works. The South Side has a new Le Panorama Express high speed quad. Mont Sainte-Anne has four terrain parks, family zones and also offers an excellent ski and snowboard school with lessons for all abilities plus daycare right on the mountain by the Gondola. At the base of Mont Sainte Anne is a small but fun ski village with après ski bars, Le Brez – for excellent fondue, ski shops and lodging at the ski in ski out Château Mont-Sainte-Anne. Children 17 and under stay free with parents at the four-star Château MSA, and lodging ranges from hotel rooms to Nordik Suites and studios to full condos. Mont Sainte Anne offers night skiing on 19 trails of the highest vertical night skiing in Canada, which is nice to enjoy in the evening when you are staying on the mountain. Of course, many families choose to stay in the exciting, historic environment of Quebec City at the famous Le Château Frontenac or the more boutique small Hotel Le Germain Charlevoix – both in the four hundred year old Vieux Quebec. The skiers commute, or shuttle, to the ski slopes of Sainte Anne is just a half hour’s drive. Other activities at Mont Sainte Anne include dog sledding, indoor swimming, ice skating, a visit to the Ice Palace – built each winter, or a trip to the Montmorency Falls (taller than Niagara Falls). Mont Sainte Anne ski slopes and lifts can get busy on holidays and weekends, but with a three sided mountain, you can usually find un-crowded trails or slip into the trees for some glade skiing. Be sure to ski the kids to the sugar shack along La Pichard trail, this Cabine a la Sucre serves maple syrup on snow – a delicious Canadian treat. During your family ski trip to Mont Sainte Anne, you should drive a half hour north to ski Le Massif as well.